Today was my first day off work since enduring a nasty cold and ignoring household chores for the past week. Less medicated and more motivated, I had a long list to tackle. I allowed junk mail, cardboard boxes, receipts and tea mugs rest in unsuitable places. Knowing our rental company practices unannounced bi-annual inspections was incentive enough to at least make the place presentable, and if I worked to make the house nice why shouldn't I be presentable as well? As an early birthday gift my Mom sent me an incredible gift box from her favorite coffee shop, Espresso Elevado. Due to extreme sinus congestion I had not had any coffee drink for over a week, why waste deliciousness on a muted palette? Since I can once again taste I used my french press to brew an incredible cup of Ethiopian Sidamo light roast coffee and it was divine, especially with the lemon biscotti from The Biscotti Bar, included in the gift box. I was ready to begin my day of housework... almost. The pair of Summertime Moonbeams by John Fluevog that I had so fortunately found have gone unworn. Sacrebleu! The only answer was to wear them. Today. 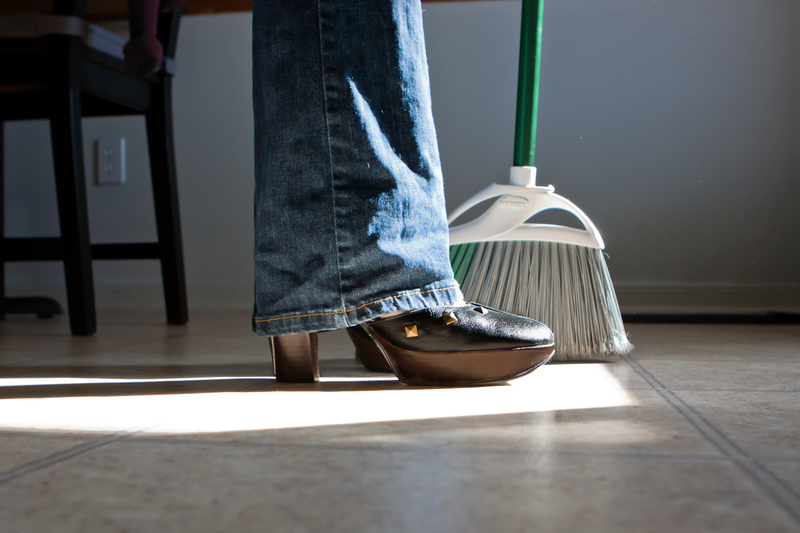 So the subject of my photo-a-day, "What I do", is what I did -- housework in Fluevogs. All this and some incidentals were performed while wearing my gorgeous and comfortable Fluevogs. I may not have put on makeup or deodorant (oops) but I wore fabulous footwear. Oh yeah, I also got my much-anticipated rental lens this morning, the Canon EF 24-70mm f/2.8L USM.